If you're going to put a smart thermostat and some intelligent software in charge of your home's heating, you want to make the right choice: and here we're going to help you pick between the 3rd-gen Nest Learning Thermostat and the 2nd-gen Hive Active Heating. 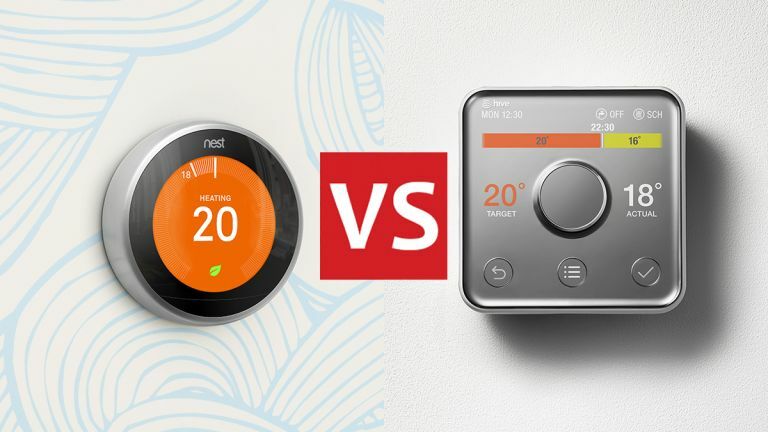 These are two of the best smart thermostats you can find on the market at the moment, and we're happy to recommend both of them – but there are differences in the hardware and the companion apps that you need to know about. Read on for the full lowdown. The 3rd-generation Nest Learning Thermostat is perhaps one of the most recognisable smart home devices out there at the moment – the original Nest appeared in 2011, and the design hasn't changed much since. It's a bright, circular screen sitting on your wall, or on a desk (with the associated stand), clearly displaying the current temperature. The newest edition of the thermostat has a display that's easier to see than ever, and a higher resolution than the Nest Thermostat E. It works with most boilers and heating systems, and with the 3rd-gen system can now control your hot water tank as well, though Nest does recommend you get a professional to install it for you – so remember to factor this into your budget. The 2nd-gen Hive Active Heating thermostat is an attractive-looking box too, a little bit more like a traditional thermostat, which should fit in neatly with the aesthetic of most homes. As with the Nest device, you can see current and target temperatures on the screen, and control the temperature manually. Again, it should work with most boilers and heating systems, unless you have something older or more unusual installed, and it can control a separate hot water tank if needed. You'll need to get a qualified British Gas engineer to set up the thermostat and its wiring for you, so include this when you're calculating the overall price (you don't have to buy your energy from British Gas to use Hive). Both the Nest Learning Thermostat and the Hive Active Heating thermostat let you set the temperature of your house from your phone – whether you're sat in the living room or just about to leave the office. You can also set the heating to come on and off on a schedule, with everything managed through the apps (they're both very simple to use, though we reckon the Nest just has the edge in terms of polish). The Nest device has the advantage when it comes to learning about your heating habits, hence the name – the idea is that the Google AI working behind the scenes gradually works out when you need your heating to come on and off and starts to take care of it automatically, introducing efficiency improvements and saving you a bit of money along the way. Another trick that both the Nest and the Hive systems can do is detect when you're not at home, thanks location tracking in the associated apps on your phone (if you're happy to enable them) – the Nest thermostat also has presence sensors built into it to help with this. The end result is you don't have to think too much about configuring your heating. If you buy multiple thermostats, you can control multiple zones – up to three zones with Hive Active Heating and up to 20 with the Nest Learning Thermostat. A point to Nest then, though to be honest most people aren't going to need more than three zones, unless you live in a particularly spacious place. Both Nest and Hive have a variety of other smart home devices you can add to the mix, and as long as you buy everything from the same series, it all works very well together. Nest makes security cameras and smoke alarms as well as smart thermostats, while Hive also puts out cameras, lights, sensors, and smart plugs – you can fully Hive-ify your home if you like Hive Active Heating. As for other gear, both these smart thermostats work with the ever-useful IFTTT (If This Then That), which lets you connect all kinds of different smart home apps and services together. Both Nest and Hive thermostats can be controlled with Alexa or Google Assistant commands, should you happen to have an Echo or a Google Home around, but neither work with Apple's HomeKit. The mobile apps that go along with these smart thermostats are both very well designed and you won't have any complaints, whichever one you go for. Google of course has more experience building apps, and the one for the Nest Learning Thermostat is a little more intuitive than the one for Hive Active Heating, as we alluded to above. Should you be looking outside these two products? Don't forget Nest also makes the cheaper Thermostat E, which does a lot of the same tricks as the main 3rd-gen Nest but cuts a few corners with build quality and is available at a lower price. Hive only makes the one thermostat, but it is available in different finishes, as is the Nest device. Nest has been making smart thermostats for a lot of years now, most recently under the supervision of Google, and it shows in terms of the quality of the hardware, the quality of the apps, and the smart learning system that underpins everything. This is the 3rd generation of the device remember. Hive Active Heating is playing catch-up, but the most recent 2nd generation of the product has definitely narrowed the gap significantly in terms of what these two systems can do for you. They're now well matched in most of the key areas, as we've explained above. We do like the many other smart home products Hive makes, and if you're looking for one system to rule everything in your house or flat then the Hive Active Heating device definitely appeals. On the other hand, the Nest Learning Thermostat is arguably the better device from a standalone perspective, because of its extra intelligence. As for prices, check the widgets on this page for the latest deals. At the time of writing, the Nest option is slightly more expensive, but there's not a huge amount in it – and special offers are being added all the time by both Hive and Nest. We wouldn't say price would be a huge factor in deciding which one to go for.